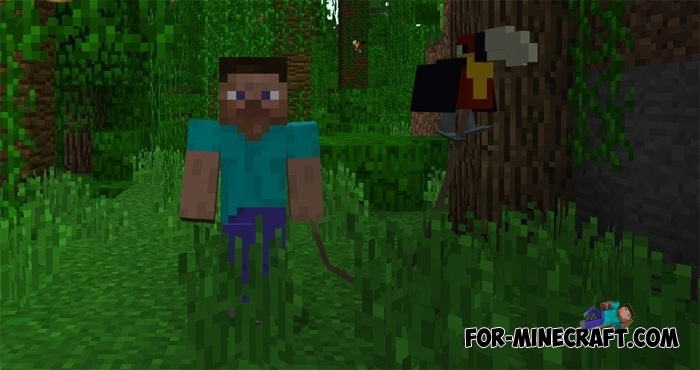 One of the expected mobs in MCPE 1.2 are parrots that will complement the already small list of birds. But right now you have the opportunity to add a new bird with some similarities to the parrots. A toucan is also a pretty exotic bird that inhabits everywhere and which can become your personal bird. Toucans are not very sociable and basically fly around the world that causes some difficulty catching. You will need a little luck, dexterity and leash to catch this bird. Put it in your home as a pet, other original animals are neutral to toucans. Angry Birds texture pack for MCPE 0.16Angry Birds is an updated textures are based on the popular game for mobile devices..
Mo Animals mod for Minecraft PE 0.10.5 by NexdroThis version of Pocket edition , inspired by the popular modification for the PC.